There were certainly fireworks in U.S. manufacturing numbers. ISM data showed a blockbuster jump, soaring nearly 3 points to 57.8. Within the data there were some signs of falling inflation pressure however, with price growth decelerating sharply, hitting a 7 month low. 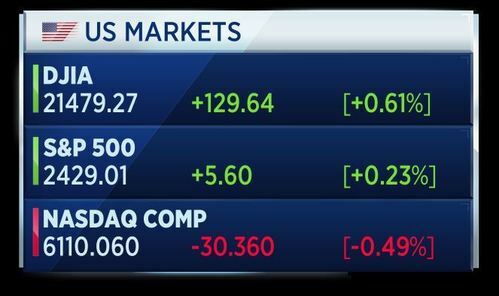 The Dow and S&P recorded gains, while the Nasdaq fell in yesterday's session. 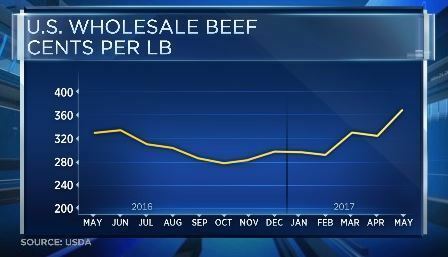 Ground Beef prices have fallen ahead of the biggest barbeque day of the year, recently hitting a three year low. That means your homemade burger is cheaper this Fourth of July. It looks like it may even get cheaper, with new retail players like German discounters Lidl and Aldi vying for market share stateside with big offers. 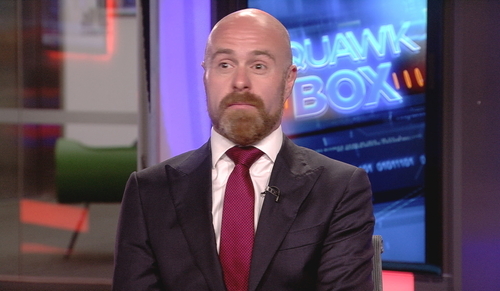 James Athey, global fund manager at Aberdeen Asset Management, says there is not a lot of value in global bond markets. If we are therefore on a path towards some normalization in the rate complex in many of these central banks that have had uber easy policy, it is difficult really to see a lot of value in bond markets. James says a steep yield curve offers some protection to central bank policy changes. North Korea has fired a ballistic missile which has landed in the Sea of Japan. A main government spokesperson said there were no reports of damage to planes and ships in the proximity. Donald Trump responded to the missile launch on Twitter, writing: "Hard to believe that South Korea and Japan will put up with this much longer. 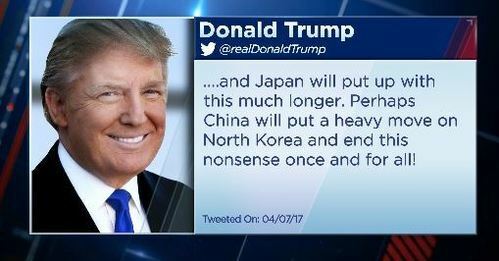 Perhaps China will put a heavy move on North Korea and end this nonsense once and for all." Foreign ministers from four Arab countries blockading Qatar will meet in Cairo to discuss the situation. This as Qatar delivered a handwritten response to a series of demands from the country, which it has said seemed designed to be rejected. The list included shutting down the news channel Al Jazeera and closing a Turkish military base. French President Emmanuel Macron says he aims to reform the government by reducing the number of MPs and allowing more proportional representation. 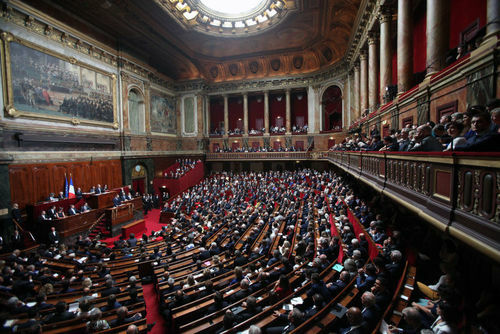 In a speech to lawmakers in Versailles, he threatened a referendum, if Parliament doesn't approve the proposed changes within a year. Macron also addressed France's terrorism threat, announcing new security measures. U.S. president Donald Trump is spending the 4th of July in in New Jersey, ahead of the G20 summit, where he will meet world leaders including Russian President Vladimir Putin. NBC's Chief White House Correspondent Hallie Jackson has the latest. U.S. markets may be closed for the Independence Day Holiday, but American companies in Europe are expecting to do bumper business this Fourth of July. 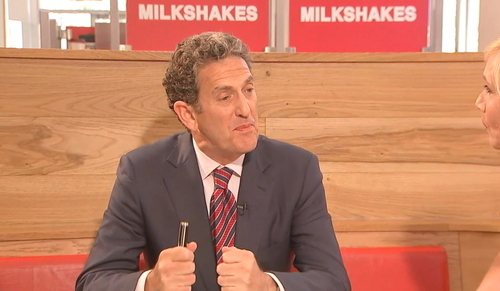 John Eckbert, U.K. CEO of Five Guys, says the burger chain opened its first U.K. store 4 years ago today. We chose the 4th of July as the first day we would do business in the U.K. as a reference back to our American heritage. We didn’t know what to expect, really. This was the first store outside of America and Canada that had opened for Five Guys. We opened on the 4th of July, we had our first customer show up at 4:00 in the morning, even though we didn’t open until 11:00, so it’s been an amazing 4 years for us here. These are the top news stories for the hour. It's the Fourth of July and the dollar gets in the spirit. The greenback rises to a seven week high on the back of strong ISM numbers, which also sends the yield on the two-year Treasury to the highest level since 2009. North Korea defies warnings from world leaders ahead of the G20 summit, firing a ballistic missile into Japanese waters. It's an agenda worthy of the Sun King. French president Emmanuel Macron lays out an agressive reform plan in Versailles, pledging to cut the number of lawmakers and threatening a referendum. Santander launches its cash call, pricing the rights issue at a 19 percent discount to its closing price yesterday, as it looks to fund the takeover of Banco Popular. David Wright, co-director and senior scientist at the Union of Concerned Scientists, says the missile fired by North Korea reportedly had a range of more than 930 km and flew for 37 minutes. A missile of that range would need to fly on a very highly lofted trajectory to have such a long flight time. Assuming a range of 950 km, then a flight time of 37 minutes would require it to reach a maximum altitude of more than 2,800 km (1700 miles). So if the reports are correct, that same missile could reach a maximum range of roughly 6,700 km (4,160 miles) on a standard trajectory. That range would not be enough to reach the lower 48 states or the large islands of Hawaii, but would allow it to reach all of Alaska. North Korea has now claimed the missile reach an altitude exceeding 2,800 km and flew for 39 minutes. Sainsbury's has delivered first quarter sales growth above analysts' expectations. The UK supermarket chain posted a 2.7 percent increase in Q1 sales, in part thanks to a recent period of warm weather. Online grocery sales grew by 8 percent. The company said the market is competitive and that is has worked with suppliers to improve its price position versus competitors. Sainsbury's says it's pushing ahead with its cost saving programme and that it continues to monitor price pressures closely. Sheila Patel, CEO of International, Goldman Sachs Asset Management, says opportunity lies in selectively looking for growth in the market place. When you look at what’s gone on, you see financial conditions that actually look pretty good. Growth in the U.S. and recovery that people have found sustained. I think you look at EM and you say the underlying conditions for EM are quite positive. 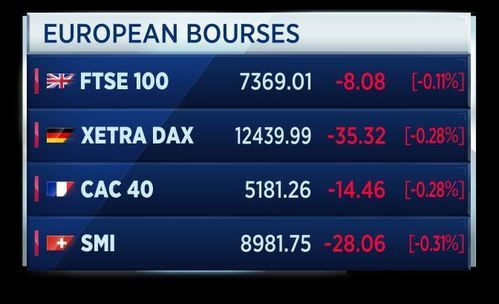 European markets have opened to the downside. 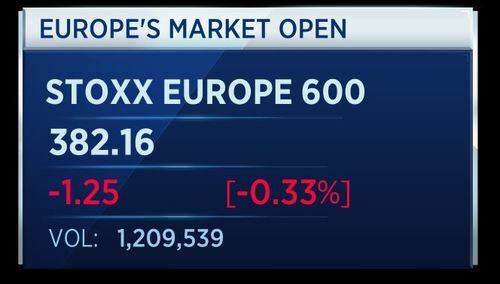 The Stoxx 600 is off by a third of a percent. All sectors are in the red at the start of Tuesday trade. These are the stocks moving markets this morning. Click or tap on the arrows to switch between share price charts. A group of Clariant shareholders have urged others to reject the company's proposed merger with Huntsman. Activist hedge fund Corvex and roofing maker Standard Industries' investment arm, who have a combined 7.2 percent stake in Clariant, say the deal won't unlock value. The Swiss chemical maker and Huntsman announced the $20 billion merger pact in May. Sainsbury's has delivered first quarter sales growth above analysts' expectations. The U.K. supermarket chain posted a 2.7 percent increase in Q1 sales, in part thanks to a recent period of warm weather. Sainsbury's says it's pushing ahead with its cost saving programme and that it is continuing to monitor price pressures closely. Spain's Santander has launched its 7.1 billion euro rights issue, pricing the cash call at a 19 percent discount to yesterday's closing price. It comes as the lender looks to finance the takeover of Banco Popular. Existing shareholders have until later this month to decide whether they want to buy into the capital increase. Santander says it will set aside billions of euros to cover Popular's bad property assets. Banca Carige has approved a series of measures in a bid to rebuild its balance sheet. The Italian lender is planning a capital increase of up to 500 million euros and says it will sell 1.2 billion euros of bad loans. European stock markets are lower, but M&A boosts a few individual names. Among them, Germany's Stada, after the generic drugmaker says it could get a renewed bid from private equity players Bain Capital and Cinven. Santander slips as it launches its cash call, pricing the rights issue at a 19 percent discount to its closing price yesterday, as it looks to fund the takeover of Banco Popular. Argos delivers for Sainsbury's as the U.K. retailer reports like-for-like sales ahead of forecasts, while cost-cutting improves its bottom line. Sweden's Riksbank announces it has kept its repo rate unchanged at -0.5 percent. The central banks bond purchases are going according to plan. It says the buying of government bonds will continue during the second half of 2017, as decided in April. The central bank does not expect a first rate increase until the middle of 2018. However, higher inflation and lower risks from abroad mean the bank is less likely to cut the rate. James Rubin, former U.S. assistant secretary of state for public affairs in the Clinton Administration from 1997-2000, discusses the position of the U.S. on the World Stage. Many people forget, the Declaration of Independence, as much as it was independence from the British, it was a call to the world for help as a nation state. And the French and the Spanish took us this call. Without the French and the Spanish, America never could have defeated the British and come into being. That’s why the United States has always understood its role internationally. Sadly, tragically, hardly a surprise, with an inexperienced, rather vulgar man as our president, respect for the United States and its leadership role is collapsing. The German DIHK Chamber of Commerce says it expects German exports to Britain to fall 5 percent in 2017, but sees exports to the U.S. rising 7 percent. The Chamber says the EU-Japan free trade deal would be of real elementary importance for the German economy due to the impact on world trade. Norway's sovereign wealth fund has acquired a 49 percent interest in 1101 New York Avenue NW in Washington, D.C. This is a joint venture with Oxford Properties Group. The wealth fund is investing $190.8 million in the stake, valuing the property at $389.3 million. This follows on from yesterday's announcement that the fund had invested in 900 16th Street, Washington, D.C.
Worldpay Group PLC confirms its has received a preliminary approach from Vantiv and JP Morgan Chase Bank in relation to a potential acquisition. U.K. June construction PMI dipped to 54.8 points versus May's 56.0 points. This was below Reuters forecast of 55.0 points. 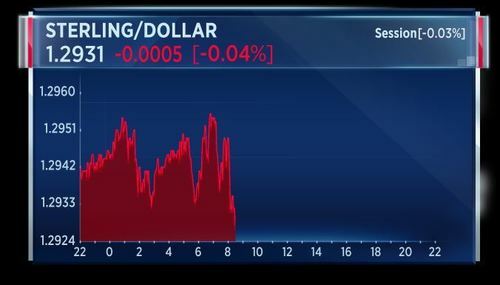 There's little sterling reaction to the PMI data. The currency is broadly flat against the dollar. Germany's interior minister says Russia is likely to seek to influence the German election in September, according to Reuters. The minister says data taken during the hack of the German Parliament in 2015 could surface in the weeks before the election. Meanwhile, Turkey's defence minister says the country will cooperate with France and Italy on a national missile defence system project, according to TRT Haber. 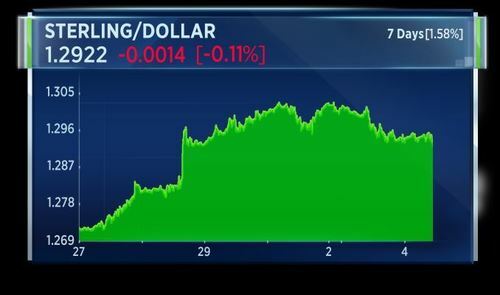 Sterling dipped to a six-day low of $1.2918 following the U.K. construction data. it has pared losses back to $1.2922. North Korea launched what it claimed to be its first successful inter continental ballistic missile Tuesday morning, just days before the G20 summit in Germany. Reporter Makiko Utsuda said the Japanese government confirmed that a missile was launched from North Korea’s western coast and flew for approximately 40 minutes before falling into the sea of Japan. She said the range and altitude achieved by the rocket is significantly higher than previous missiles test and shows how far North Korean technology has advanced. European commission president Jean-Claude Juncker expressed his frustration with the EU this morning during a plenary session review of the Maltese presidency earlier this morning. The European parliament is ridiculous, really ridiculous. I salute the MEPs who bothered to be here. But the fact that only 30 MEPs sit in this debate shows sufficiently that the Parliament is not serious, I wanted to say it today. If Mister Muscat was Ms Merkel it’s unimaginable, or Mister Macron, we would have a full house. Parliament is totally ridiculous. Sticking with the Fourth of July theme, celebrations of American culture are taking place across the world this Independence Day. To this end, Major League Baseball has set-up a baseball experience in London's Hyde Park, as it seeks to raise the sport's profile in Europe. Charlie Hill, managing director of MLB Europe and Shawn Green, MLB All-Star, spoke to CNBC’s Tania Bryer about raising the sport’s popularity in the U.K.
Hill had this to say. We’ve had huge success growing the sport in Asia and in Latin America, and the new commission has been really clear it’s now time to focus on Europe. Shawn Green said this was the first time he’d been out of North America during Independence Day. I’ve been in Toronto for a long time but they have July 1st Canada Day. This is a little bit different but at least I’m here at an American restaurant and I’m going to be playing an American sport. Germany's Interior Minister earlier express fears that Russia is likely to try and influence the upcoming election in September, after their efforts to influence the U.S. and French elections. However, the head of Germany's domestic intelligence agency says they have no reliable evidence that Russia was behind recent cyber attacks. The missile launched by North Korea on Tuesday was an intermediate-range ballistic one and presented no threat to Russia, RIA news agency quoted Russia's Defence Ministry as saying. The missile reached an altitude of 535 km (334 miles) and flew around 510 km before falling in the central part of the Sea of Japan, the ministry said, citing its data. Gold sentiment among Western investors retreated in June from May's 5-month high, falling as prices whipped higher and then lower while global stock markets set new record highs. Users of BullionVault – the largest online market for physical precious metals – cut their total gold holdings for the third month running. New interest was also weak, with the number of new users in both the US and Eurozone again setting the lowest monthly level since gold bottomed at 6-year lows in December 2015. Across June as a whole, the number of people starting to invest or growing their holdings slipped 8.4% from the previous month. The number of net sellers rose 19.3% from May's 8-month low. 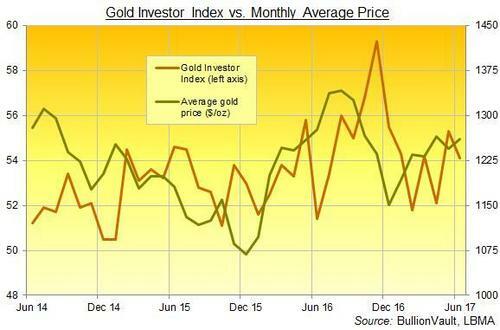 The developments saw the Gold Investor Index – a unique measure of private sentiment towards physical bullion – drop to 54.1 from May's level of 55.3, the highest reading in 2017 so far. France has the right to bring criminal charges against Uber for running an illegal taxi service, the European Union's (EU's) top court said on Tuesday. 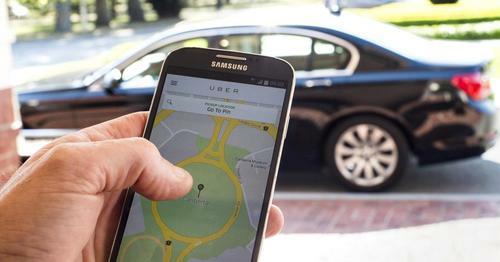 Criminal law proceedings were brought against Uber in France in 2016 when a court in Lille said that the U.S. company was guilty of running an illegal transportation service. The court was referring to UberPop which puts passengers in touch with non-professional and unlicensed drivers. Uber has argued, however, that the proceedings were based on a law which concerns an "information society service" or more broadly an internet company, and therefore required that the European Commission, the EU executive, should have been notified. CNBCUber tried to appeal the criminal charges on an EU law technicality, which the ECJ didn't agree with. Saudi Arabian Airlines expects U.S. laptop ban to be lifted no later than July 19. That's according to Reuters citing the State News Agency. And that's all from us here at World Markets Live. Join us tomorrow from 0600 London time for a full day blog with analysis, breaking news and more. Till then, have a great day and Happy July 4th to our readers stateside.